Now that you can invite anyone you want to Google+, the floodgates are open. If you've been bummed out about not being able to share the joys of Google+ with your friends and acquaintances, make use of that handy envelope icon the right side of your stream page. Just enter the email addresses of the people you want to invite, and hit the "Invite" button. Once they've been added, send them back here for the latest Google+ tips. The first week, we covered the basics. This week, we're diving in a little deeper. The minimum information required on a Google+ profile is your name. If you don't fill out the profile section, it will get deleted by July 31. So claim yours if you want it! If you want to see how your profile looks to other people, you can click on the "View profile as..." button on the right of the profile. You can enter a specific name or as "Anyone on the web." When you hover over a circle, you can click on an individual to look at their profile. You can now invite people to Google+ with an address book uploader, according to +Paul Lindner. First, create and export an address book file from your Outlook, Apple, Thunderbird or Gmail account in VCard/VCF/CSV format. Then go to your circle and click on the Upload address book link. If you're looking for interesting people to add to your circles, use the Google profile search at the top of your page. Enter whatever your interest or hobby is, such as "food" or "photography", and search. Many people appended their professions or interests to their profile names. In your Photos section, you will be able to see 4 sections: Photos from your circles, Photos from your phone, Photos of you, and Your albums from Picasa. Photos from your circles are photos that people in your circle have shared via their posts. If you enable Instant Upload on your Android smartphone, you'll be able to view photos and videos you've captured with your phone in a private folder. No one can see them except you. Your albums from Picasa are viewable by anyone you've already shared them with. In Photos of you, you can see photos where you've been tagged. As you tag and are tagged by other people, you can also see Photos of you with fill up with pictures of you and your friends. Take advantage of the photo editing tool Picnik. It's pretty powerful and I'll be covering it in-depth on a later post. Picasa tags don't convert automatically to Google+, so if you tagged people in Picasa, you'll have to tag them again in Google+. I believe there's a fix coming forth for this, though. 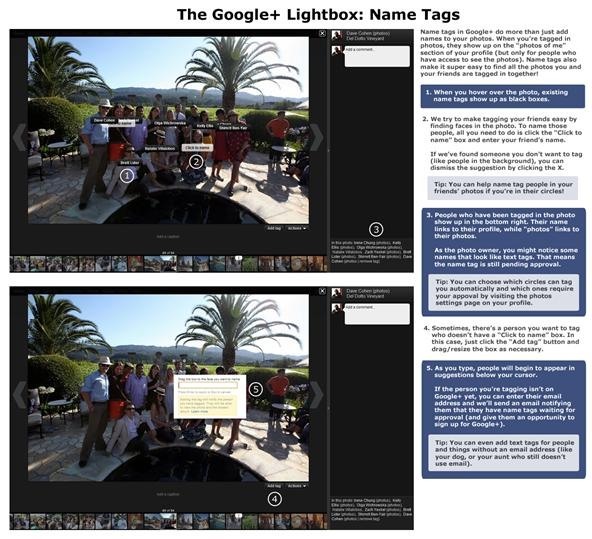 +Rick Klau figured out a neat workaround for posting to Blogger from Google+. You have to go into your Blogger settings, add a "secret" word to your blog's email address and save. Then create a circle and add this address to it. When you post from your stream, include your blog's circle and hit Share. ManageFlitter pushes all your public posts to your Twitter account. All you have to do is add your Google+ profile URL and log into Twitter. Posts with more than 140 characters will link back to the Google+ post itself. What Google+ tips have I missed? Share them in the comments or in our forum.